Those words, written by Beethoven on the manuscript of his Missa solemnis (but not included in the first published score), have been understood for the best part of two centuries as a motto for the whole work. That this monumental Mass is a statement of a highly personal religious faith, composed ‘from the heart’, has rarely been questioned. It is borne out in the score’s very first tempo marking: Assai sostenuto. Mit Andacht (‘Very sustained. With devotion’); and strikingly, the expression Mit Andacht occurs again in the hushed introduction to the fourth movement, the Sanctus. But what kind of faith is expressed here? From Beethoven’s letters and diary entries—and also the famous Heiligenstadt Testament written in the crisis year 1802—it is clear that the composer was sustained through many severe emotional and physical trials by a sense of God, experienced ‘von innern’, ‘from within’. But by the time he began work on the Missa solemnis in 1818, this certainly cannot be viewed simply in terms of the orthodox Roman Catholic faith in which he was born and raised. Indeed Beethoven’s earlier enthusiasm for the French Revolutionary values of republican democracy would have put him beyond the pale as far as the conservative church authorities of his time were concerned. It is not clear if Beethoven ever went so far as to embrace the French archradical Robespierre’s notion of a ‘Supreme Being’, independent of any specific religious confession; but it is well-known that he saw Napoleon’s coronation as Emperor, in the presence of Pope Pius VII in 1804, as a betrayal of the humanist ideals he then cherished. There is plenty of evidence, both in Beethoven’s music and in his written and reported comments, that his faith in those ideals proved more robust and enduring than his belief in Napoleon. However the year of Napoleon’s final defeat at Waterloo, 1815, can be seen as marking a spiritual fault-line in Beethoven’s life and career. Beethoven was 45 at the time, and so well placed for a mid-life crisis—even though he only had another twelve years to live. At first he participated in the 1815 victory celebrations with every sign of enthusiasm, composing the crudely populist Wellington’s Victory, and the far from glorious cantata Der glorreiche Augenblick (‘The Glorious Moment’), the latter falling quickly into well-deserved obscurity. But the political and cultural climate was already changing radically, and not at all to Beethoven’s advantage. At the Congress of Vienna (1814-15) the victorious European powers brought about a massive reinforcement of the old conservative order. Under the repressive regime of Prince Klemens von Metternich, Beethoven became a target of official suspicion. A secret police report on the composer—not at all flattering in its content—survives from 1815. Vienna in the years after the Congress may have been more stable than during the Napoleonic wars, but its smug cosiness was also intellectually and artistically stifling. In so-called Biedermeier Vienna, artists avoided potentially dangerous subjects, catering for the tastes of the burgeoning middleclasses through such safely non-political subjects as idealised country life and historical romance. Enthusiasm for Beethoven’s music in Vienna declined as Rossini became the new musical rage. Meanwhile Beethoven was struggling to come to terms with two dreadful personal realisations. In 1814 he had made his last public appearance as a pianist in a performance of his Archduke Trio (Op 97), during which it had become painfully obvious that his increasing deafness had destroyed his prospects as a performer. With this his sense of isolation had intensified, and probably along with it his awareness that he was unlikely ever to find the ‘fair wife’ he had celebrated in his opera Fidelio (revised version, 1814) and yearned for throughout his adult life. The death of his brother Caspar Carl, also in that fateful year of 1815, had seemed to hold out the hope of redemption through another kind of love. Beethoven now became involved in a long, painful, often acrimonious legal battle with his brother’s widow, Johanna, for custody of his nephew Karl. But even after Beethoven’s legal ‘victory’ in 1820 the suffering continued—Beethoven increasingly possessive and suspicious, Karl increasingly desperate—until the latter’s attempted suicide in 1826. It is not very surprising then to find that the years immediately following 1815 were some of the least artistically productive of Beethoven’s mature career. It was only in 1818-19 that the creative resurrection began fully with the composition of the colossal Hammerklavier Sonata, Op 106 (a symphony for solo piano in all but name). Then in 1819 Beethoven began work on an important new commission: a Mass for the enthronement of his former pupil and abiding patron, Archduke Rudolph, as Archbishop of Olmütz (now Olomouc in Moravia) on 9 March 1820. That the relationship with Rudolph was important to Beethoven is evident in the dedication to the Archduke of the Piano Sonata, Les Adieux (‘The Farewells’), Op 81a, whose three movements movingly depict the emotional sequence ‘Farewell’, ‘Absence’ and ‘Return’—Rudolph had been forced to flee Vienna during the French occupation of 1809. So the commission to write the Missa solemnis was both a timely reminder of enduring friendship and a major professional confidence booster. However when the day came for Rudolph’s enthronement, Beethoven had only reached the Credo of the Mass. It took him until May 1822 to arrive at a complete score, and even then there were further revisions to come. It wasn’t until 19 March 1823 that Beethoven was at last able to present Rudolph with a fair copy. For an artist who had begun to look seriously at Eastern religious thought, in particular the Hindu Bhagavad-Gita, and who could write that ‘Socrates and Jesus were my models’, Sailer’s writings would have been a literal godsend. Evidence of Sailerlike stress on ‘the most inward feeling’ (‘innerste Empfindung’) can be found in Beethoven’s minute but significant adjustments to the Mass text: the additions of highly personal ‘O’s and ‘Ah’s to the word ‘miserere’ (‘have mercy’) in the Gloria, the repetitions of the word ‘credo’ (‘I believe’) that run refrain-like through the Credo, and the frequent stress by repetition of the word ‘et’ (‘and’) in the latter movement, as though Beethoven were keen to indicate that the meaning of the Creed as a whole, as a dramatic narrative sequence, is more important than any of its individual constituent parts. Even so, despite such patent attempts to personalise the expression of the Mass text in the Gloria and Credo, the opening Kyrie is striking more for its formal balance and elegant craftsmanship than for visionary drama. In the opening prayer, ‘Lord, have mercy’, and in the smoothly flowing counterpoint of the central ‘Christ, have mercy’, there is more of a sense of collective than individual penitence. In the outer sections the solo voices are spotlighted only briefly, and throughout their expression is hardly differentiated from that of the chorus. There is little of the sense of urgency one finds in the Kyrie sections of Bach’s Mass in B minor, which Beethoven may well have seen before or during the composition of the Missa solemnis. (Beethoven had written to the publisher Breitkopf asking for a copy of the Mass as early as 1810). That only makes the eruptive Allegro vivace opening of the Gloria all the more arresting. The chorus is now swept along in a brilliant, surging orchestral current—we may feel closer to the opera house than to the cathedral. The phrase ‘Gratias agimus’ (‘We give you thanks’) brings a drop in tempo and a swing to the key of B flat major, which is to remain a strong alternative to the home key of D major throughout the Mass. The heart of the Gloria is the much slower ‘Qui tollis peccata mundi’ (‘who bears the sins of the world’). Now the personal element, kept in the background in the opening Kyrie, stands forward, with the choral sopranos pushed to throat-straining high B flats at the climactic ‘qui sedes ad dexteram patris’ (‘who sits at the right hand of the father’). Beethoven’s reverence for Handel—and particularly for the ‘Amen’ fugue that concludes Messiah—is evident in the mighty 4/4 fugue at ‘In Gloria Dei patris’ (‘In the glory of God the father’). This seems to be building, like the Handel, to a solid ‘Amen’ conclusion; but at the last moment Beethoven rips the rug out from under our feet, hurling us back into the original surging 3/4 for a return of the Gloria’s opening words. The final ‘Gloria’ is shouted out by the chorus clear of the orchestra’s emphatic final chord, as though straining beyond the ritual formality so beautifully depicted in the Kyrie. B flat major, the ‘alternative’ key in the Gloria, becomes the home tonality for the Credo. The upward leaping opening figure recalls the springboard motif that sets the Hammerklavier Sonata (also in B flat) in motion. The resemblance may have been deliberate. Not only was the Hammerklavier also dedicated to Archduke Rudolph, an early sketch for its superb opening motif was fitted by Beethoven to the words ‘Vivat Rudolphus!’ (‘Long live Rudolph!’). At the words ‘Et incarnatus’ (‘And he was made flesh’) there begins one of the most famous illustrative passages in the Mass. As chorus and orchestra intone the words in the then-archaic Dorian mode (a D minor scale, but with a sharpened sixth and a flattened seventh) a solo flute seems to flutter on high, free of the main tempo, magically representing the hovering of Holy Spirit, dovelike, above the Virgin Mary at Christ’s conception. After dwelling lovingly on this image, then building to an ecstatic climax on ‘cuius regni non erit finis’ (‘whose reign shall have no end’), Beethoven hurtles through the next set of dogmatic assertions, driving them forward with repetitions of ‘Credo, credo’. As the musicologist Joseph Kerman puts it, ‘sheer intensity of belief’ seems to outweigh ‘belief in any particular proposition.’ But then the final words of the Credo, ‘Et vitam venturi saeculi, Amen’ (‘And the life of the world to come, Amen’), are elaborated into an immense fugue—the very fugue whose composition (according to Anton Schindler) caused Beethoven such agonies. Strenuous as much of the counterpoint, the ending is surprisingly calm, with woodwind and string scales vanishing upwards like clouds of incense. Beethoven fuses the Sanctus and Benedictus sections of the Mass into a single, continuous movement. The Sanctus, with its short ‘devout’ introduction (Mit Andacht), is unusually concise and prevailingly hushed. It is at the words ‘Pleni sunt caeli et terra gloria tua’ (‘Heaven and earth are full of your glory’) that soloists, chorus and orchestra break out in joyous, dancing Bachian counterpoint. In grander celebrations of the Mass in Beethoven’s time it was customary to precede the Benedictus—the point at which the sacramental bread and wine are consecrated—with a quiet improvised organ introduction. Beethoven duly provides a hushed organ-like Praeludium, gorgeously scored for low woodwind and lower strings, with organ pedal support. Its rich, deep sonorities contrast exquisitely with the sound of high solo violin and flute—a sudden ray of light—depicting the descent of the Divine presence. The serene dance-like character of the Andante molto cantabile that follows, the solo violin arching and trilling, birdlike, high above the voices—has offended some purist ears. For others it is simply the most glorious thing in the whole score—a deliciously pure expression of the concept of ‘blessedness’. It is in the final Agnus Dei that the tension between liturgical and secular, operatic expression becomes acute. The darkly intense opening prayer for mercy, led by the bass soloist, is set in B minor, the key Beethoven characterised as ‘black’. Tempo and mood become more animated and hopeful at the words ‘Dona nobis pacem’ (‘Grant us peace’). But before long something extraordinary happens: threatening martial fanfares are heard, distantly at first but with growing menace, in the ‘alternative’ key of B flat. The soloists’ prayers for peace (marked ängstlich, ‘fearfully’) take on an almost desperate urgency, which only intensifies when this martial assault returns, with still greater force, at the climax of the movement. Was Beethoven remembering the bombardment of Vienna in 1809? Faith and doubt co-existing, neither cancelling out the other—if that is what is expressed in the ‘not quite resolved’ ending of Beethoven’s Missa solemnis, it only makes this highly personal confession of faith more acutely relevant and enduringly fascinating. Ces mots, écrits par Beethoven sur le manuscrit de sa Missa solemnis (mais non inclus dans sa première édition), ont été interprétés durant près de deux siècles comme une devise valant pour l’ensemble de l’œuvre. Que cette Messe monumentale soit l’expression d’une foi religieuse hautement personnelle, composée avec «le cœur», voilà qui n’a que rarement été mis en doute. D’ailleurs la toute première indication de tempo de la partition le confirme: Assai sostenuto. Mit Andacht. («Assez soutenu. Avec dévotion.»)—et de façon marquante, l’expression Mit Andacht réapparaît au cours de l’introduction modérée du quatrième mouvement, le Sanctus. Mais quel genre de foi se trouve ici exprimé? D’après les lettres et journaux intimes de Beethoven—également le fameux «Testament de Heiligenstadt» rédigé au cours de l’année de crise 1802—il est évident que le compositeur, traversant de multiples épreuves émotionnelles et physiques, trouva du réconfort dans une approche de Dieu vécue «von innern»: «de l’intérieur». Mais en regard de l’époque où il commença de composer la Missa solemnis, en 1818, une telle approche ne saurait être simplement perçue en termes de foi catholique romaine conventionnelle, dans laquelle il avait cependant grandi. De fait, l’enthousiasme du jeune Beethoven pour les idéaux de démocratie républicaine véhiculés par les valeurs de la Révolution française l’avait rendu peu fréquentable, du moins aux yeux des autorités religieuses conservatrices de son temps. Le doute subsiste quant à savoir si Beethoven alla jusqu’à faire sienne la notion, on ne peut plus radicale et dissociée de toute confession religieuse spécifique, de l’«Être suprême» d’un Robespierre; ce que l’on sait, par contre, c’est qu’il vit dans le sacre de Napoléon, couronné empereur en 1804 en présence du pape Pie VII, une trahison des idéaux humanistes qu’il chérissait alors. Tant la musique de Beethoven que ses écrits et propos rapportés montrent clairement que sa foi en ces idéaux se révéla plus solide et durable que sa foi en Napoléon. Il n’en demeure pas moins que l’année 1815, qui vit la défaite définitive de Napoléon à Waterloo, peut être envisagée telle une ligne de fracture dans la vie et la carrière de Beethoven. Il avait à l’époque quarante-cinq ans, âge de la crise de la quarantaine ou «du milieu de vie»—bien qu’il ne lui restât que douze années à vivre. De prime abord, il participa aux célébrations de la victoire de 1815 avec un enthousiasme affirmé, composant la Victoire de Wellington, œuvre maladroitement populiste, et la Cantate Der glorreiche Augenblick («L’instant glorieux»), œuvre nullement glorieuse qui très vite sombra dans un oubli mérité. Cependant le climat politique et culturel était déjà en train de changer radicalement, et pas à l’avantage de Beethoven. Au Congrès de Vienne (1814-1815), les puissances européennes victorieuses œuvrèrent à un puissant renforcement de l’ordre ancien, conservateur. Sous le régime répressif du prince Klemens von Metternich, Beethoven devint une cible de la suspicion officielle. Un rapport secret de police de 1815 sur le compositeur—nullement flatteur quant à sa teneur—a survécu. Sans doute Vienne fut-elle plus stable durant les années consécutives au Congrès de Vienne que durant les guerres napoléoniennes, mais son confort imbu de lui-même se révéla également étouffant sur les plans intellectuel et artistique. Dans la Vienne biedermeier, les artistes évitaient les sujets potentiellement dangereux, préférant répondre aux goût de la classe moyenne en pleine ascension en traitant de sujets sans danger, étrangers à la politique, comme la vie champêtre idéalisée ou le roman historique. Au moment où l’enthousiasme pour la musique de Beethoven déclinait à Vienne, Rossini en devenait la nouvelle coqueluche musicale. Beethoven était alors aux prises avec deux réalisations éminemment personnelles. Lorsqu’en 1814 il fit son ultime apparition publique en tant que pianiste, interprétant son Trio op.97 dit «à l’Archiduc», il devint douloureusement évident que sa surdité grandissante ruinait à jamais les perspectives de carrière de Beethoven interprète. Son sentiment d’isolement ne put dès lors que s’intensifier, tout comme, probablement, cette prise de conscience que jamais il ne trouverait la «femme rêvée» qu’il avait célébrée dans son opéra Fidelio (révisé en 1814) et à laquelle il avait aspiré tout au long de sa vie d’adulte. La mort de son frère Caspar Carl, également en cette fatidique année 1815, avait semblé renforcer l’espoir de rédemption par le biais d’une autre sorte d’amour. Beethoven se trouva alors impliqué dans une longue, douloureuse et souvent acrimonieuse bataille légale avec la veuve de son frère, Johanna, pour la tutelle de son neveu Karl. Mais même après la «victoire» légale de Beethoven en 1820, les souffrances continuèrent—Beethoven devenant de plus en plus possessif et suspicieux, Karl de plus en plus désespéré—jusqu’à ce que ce dernier tente de mettre fin à ses jours en 1826. Néanmoins, lorsqu’arriva le jour de l’intronisation de Rodolphe, Beethoven n’avait atteint que le Credo de sa Messe. Il allait devoir travailler jusqu’en mai 1822 pour achever sa partition, et même alors plusieurs révisions s’ensuivraient encore. Ce n’est que le 19 mars 1823 que Beethoven fut enfin en mesure d’en offrir à Rodolphe une copie au propre. Pour un artiste qui avait commencé de s’intéresser sérieusement à la pensée religieuse orientale, en particulier à la Bhagavad-Gītā hindoue, écrivant même que «Socrate et Jésus sont mes modèles», les écrits de Sailer durent faire l’effet d’une bénédiction. L’insistance, dans l’esprit de Sailer, sur un «sentiment des plus intériorisés» («innerste Empfindung») se retrouve dans les infimes mais significatives modifications apportées au texte proprement dit de la messe: les «Ô» et «Ah» hautement personnels ajoutés au mot miserere («aie pitié [de nous]») dans le Gloria, les répétitions du mot «credo» («je crois») qui revient tel un refrain tout au long du Credo, ou encore la fréquente accentuation découlant de la répétition du mot «et» dans ce dernier mouvement, comme si Beethoven voulait signifier que le sens véritable de la profession de foi dans sa globalité, en tant que séquence dramatique et narrative, est plus important que les parties individuelles la constituant. L’éruptif Allegro vivace qui introduit le Gloria n’en est que plus saisissant. Le chœur se trouve dès lors emporté par un brillant et déferlant flot orchestral—on se croirait plus à l’opéra que dans une cathédrale. La phrase «Gratias agimus» («Nous te rendons grâce») s’accompagne d’un ralentissement du tempo ainsi que d’une bifurcation vers le ton de si bémol majeur, lequel se révélera, durant toute la Messe, une puissante alternative au ton principal de ré majeur. Le cœur du Gloria est le beaucoup plus lent «Qui tollis peccata mundi» («Qui enlèves le péché du monde»). Maintenue à l’arrière-plan dans le Kyrie d’introduction, la composante personnelle est désormais au premier plan, les sopranos du chœur se hissant sur les paroles «qui sedes ad dexteram patris» («toi qui es assis à la droite du Père»), point culminant de la section, jusqu’à des si bémol redoutables pour les voix. L’hommage de Beethoven à Haendel—en particulier à l’Amen fugué qui referme Le Messie—est évident dans la puissante fugue à 4/4 sur «In gloria Dei Patris» («dans la gloire de Dieu le Père»). Cette section semble devoir conduire, comme chez Haendel, à un solide Amen de conclusion, mais au dernier moment Beethoven arrache le tapis sous nos pieds, réintroduisant brusquement le mètre initial à 3/4 sur une reprise des paroles d’introduction du Gloria. Le chœur lance l’ultime «Gloria», détaché de l’emphatique accord final de l’orchestre, comme s’il se dressait par-delà le formalisme rituel si magnifiquement représenté par le Kyrie. Si bémol majeur, tonalité «alternative» du Gloria, devient le ton principal du Credo. La figure d’introduction en forme de saut ascendant rappelle le motif bondissant qui met en mouvement la Sonate Hammerklavier (elle aussi en si bémol majeur). Le rapprochement pourrait avoir été délibéré. Non seulement la Sonate Hammerklavier fut également dédiée à l’archiduc Rodolphe, mais Beethoven associa l’un des premiers états de son superbe motif d’introduction aux paroles «Vivat Rudolphus!». Sur les mots «Et incarnatus est» («Et il s’est incarné») s’ouvre l’un des passages les plus célèbres et évocateurs de la Messe. Tandis que chœur et orchestre entonnent les paroles dans le mode dorien (variante archaïque de la gamme de ré mineur, avec sixte majeure et septième mineure), un solo de flûte semble planer très haut, dissocié du tempo principal, représentant de façon magique le vol suspendu de l’Esprit saint, telle une colombe, au-dessus de la Vierge Marie lors de la conception du Christ. Après s’être tendrement attardé sur cette image puis s’être élevé jusqu’à un extatique sommet d’intensité sur «cuius regni non erit finis» («dont le règne n’aura pas de fin»), Beethoven passe vivement en revue le groupe suivant d’assertions du dogme, les précipitant sur des répétitions de «Credo, credo». Ainsi que le musicologue Joseph Kerman l’a souligné, «l’intensité brute de la foi» semble l’emporter sur «l’adhésion à telle assertion en particulier». Après quoi les ultimes paroles du Credo («Et vitam venturi saeculi. Amen.»—«Et [j’attends] la vie des siècles à venir. Amen.») donnent lieu à une immense fugue—cette même fugue dont la composition (selon Anton Schindler) causa tant de tourments à Beethoven. Aussi ardu en soit globalement le contrepoint, la conclusion est d’une surprenante quiétude, les gammes des vents et cordes s’élevant et se dissipant comme des nuages d’encens. Beethoven fusionne les sections du Sanctus et du Benedictus de la Messe en un seul et même mouvement continu. Le Sanctus, avec sa brève et «dévote» introduction (Mit Andacht), est d’une inhabituelle concision et pour l’essentiel estompé. C’est sur les mots «Pleni sunt caeli et terra gloria tua» («Les cieux et la terre sont remplis de ta gloire») que chœur et orchestre font soudainement éclater un joyeux et dansant contrepoint à la manière de Bach. Lors des offices d’apparat, à l’époque de Beethoven, il était d’usage de faire précéder le Benedictus—moment de la messe où le pain et le vin sacramentels sont consacrés—d’une paisible introduction improvisée à l’orgue. Beethoven s’y est lui-même plié en proposant un Praeludium tout en retenue évoquant l’orgue, somptueusement orchestré pour les instruments graves des pupitres des vents et des cordes soutenus par une pédale d’orgue. Ses sonorités riches et profondes contrastent délicieusement avec le timbre, dans leur registre aigu, du violon solo et de la flûte—un soudain rayon de lumière—représentant la descente de la présence divine. Le caractère serein, quasi dansant, de l’Andante molto cantabile qui s’ensuit, tandis que le violon solo décrit un arc au-dessus des voix et trille comme un oiseau, parut une offense aux oreilles de certains puristes. Pour d’autres, c’est tout simplement ce qu’il y a de plus merveilleux dans l’œuvre tout entière—l’expression délicieusement pure du concept de «béatitude». C’est dans l’Agnus Dei de conclusion que la tension entre expression liturgique et profane, voire opératique, est à son comble. D’une sombre intensité, cette «Prière pour la paix intérieure et extérieure», confiée à la basse soliste, est en si mineur, tonalité que Beethoven qualifiait de «noire».Tempo et climat se font plus animés et chargés d’espoir sur les mots «Dona nobis pacem» («Donne-nous la paix»). Mais bientôt se produit quelque chose d’extraordinaire: d’inquiétantes fanfares martiales se font entendre, d’abord à distance puis telle une menace grandissante, dans la tonalité «alternative» de si bémol. Les prières pour la paix des solistes (indiquées ängstlich, «craintivement») témoignent d’une urgence presque désespérée qui ne fait que s’intensifier lorsque cet assaut martial, avec encore plus de force, est réitéré à l’apogée du mouvement. Beethoven se remémorait-il le bombardement de Vienne en 1809 ? La foi et le doute coexistent, sans s’annihiler l’un l’autre—si c’est là ce qu’est censé exprimer l’épilogue non «pleinement résolu» de la Missa solemnis de Beethoven, rendant cette profession de foi si puissamment personnelle d’autant plus intensément pertinente et à jamais fascinante. Diese Worte, die Beethoven auf dem Manuskript seiner Missa solemnis notiert (aber nicht in die erste veröffentlichte Partitur übernommen) hatte, werden seit fast zwei Jahrhunderten als Motto des gesamten Werkes verstanden. Dass diese monumentale Messe das Bekenntnis eines sehr persönlichen religiösen Glaubens ist, „von Herzen“ komponiert, wurde selten in Frage gestellt. Das wird bereits in der allerersten Tempobezeichnung deutlich: Assai sostenuto. Mit Andacht; und auffällig ist, dass der Ausdruck Mit Andacht in der verhaltenen Einleitung des vierten Satzes, des Sanctus, wiederkehrt. Doch welche Art von Glauben wird hier ausgedrückt? Aus Beethovens Briefen und Tagebucheinträgen—und ebenso dem berühmten, im Krisenjahr 1802 geschriebenen Heiligenstädter Testament—wird deutlich, dass der Komponist in Zeiten schlimmer körperlicher und seelischer Belastungen aus einem „von innern“ erlebten Gottesbewusstsein Kraft schöpfte. Bis 1818, als er an der Missa solemnis zu arbeiten begann, lässt sich dies sicher nicht einfach auf Begrifflichkeiten des althergebrachten römisch-katholischen Glaubens zurückführen, in dem er geboren und aufgewachsen war. Beethovens frühere, aus der französischen Revolution herrührende Begeisterung für die Werte einer republikanischen Demokratie hätte ihn für die konservativen religiösen Kräfte seiner Zeit völlig unzumutbar gemacht. Es ist nicht klar, ob Beethoven jemals so weit ging, die französische erzradikale Vorstellung Robespierres von einem „höchsten Wesen“ zu teilen, die sich nicht auf eine besondere Konfession festlegte; aber allgemein bekannt ist, dass er Napoleons Krönung 1804 zum Kaiser in Gegenwart von Papst Pius VII. als Verrat an den humanistischen Idealen betrachtete, denen er damals zugetan war. Es gibt genügend Beweise, in Beethovens Musik wie auch in seinen schriftlich hinterlassenen und überlieferten Kommentaren, dass sich sein Glaube an diese Ideale als robuster und beständiger erwies als sein Glaube an Napoleon. 1815, das Jahr der endgültigen Niederlage Napoleons bei Waterloo, kann als spirituelle Verwerfungslinie in Beethovens Leben und Schaffen gesehen werden. Beethoven zählte zu dieser Zeit fünfundvierzig Jahre und war somit im besten Alter für eine Sinnkrise der Lebensmitte—auch wenn er nur noch weitere zwölf Jahre leben würde. Zunächst beteiligte er sich 1815 an den Siegesfeiern mit allen Anzeichen der Begeisterung, komponierte das plumppopulistische Orchesterwerk Wellingtons Sieg und die ganz und gar nicht glorreiche Kantate Der glorreiche Augenblick, die schnell in wohlverdiente Vergessenheit geriet. Doch das politische und kulturelle Klima veränderte sich bereits grundlegend, und überhaupt nicht zu Beethovens Vorteil. Auf dem Wiener Kongress (1814/15) erreichten die siegreichen europäischen Mächte eine massive Stärkung der alten konservativen Ordnung. Unter dem repressiven Regime des Fürsten Klemens von Metternich wurde Beethoven eine Zielscheibe amtlicher Verdächtigung. Ein Bericht der Geheimpolizei über den Komponisten—in seinem Inhalt in keiner Weise schmeichelhaft—ist aus dem Jahr 1815 erhalten. Wien mag in den Jahren nach dem Kongress stabiler gewesen sein als während der Napoleonischen Kriege, aber die blasierte Gemütlichkeit in dieser Stadt war auch künstlerisch und intellektuell erstickend. Im sogenannten „Biedermeier-Wien“ vermieden Künstler potenziell gefährliche Themen und bedienten den Geschmack der aufkeimenden Mittelschicht mit politisch harmlosen Stoffen aus einem idealisierten Landleben oder historischer Liebesromantik. Die Begeisterung für Beethovens Musik ließ in Wien in dem Maße nach, wie Rossini in Mode kam. Unterdessen mühte sich Beethoven, zwei schreckliche persönliche Erkenntnisse zu bewältigen. 1814 war er zum letzten Mal öffentlich aufgetreten, in einer Aufführung seines Erzherzog-Trios (op. 97), bei der ihm schmerzlich bewusst geworden war, dass ihm seine wachsende Taubheit seine Zukunftsaussichten als Pianist zunichte gemacht hatte. Zusammen mit diesem Gefühl der Isolation war vermutlich auch die Erkenntnis gereift, dass er wohl nie das „holde Weib“ finden würde, das er in seiner Oper Fidelio (überarbeitete Fassung von 1814) gefeiert und in seinem ganzen Erwachsenenleben ersehnt hatte. Der Tod seines Bruders Kaspar Karl, ebenfalls in jenem schicksalhaften Jahr 1815, schien ihm zunächst eine Hoffnung auf Erlösung durch eine Liebe anderer Art zu bieten. Beethoven wurde nun in einen langen, schmerzlichen, oft erbitterten Rechtsstreit mit Johanna, der Witwe seines Bruders, um das Sorgerecht für seinen Neffen Karl verwickelt. Aber auch nach Beethovens juristischem „Sieg“ 1820 hatte das Leiden kein Ende—er wurde immer besitzergreifender und argwöhnischer, Karl immer verzweifelter, bis hin zu einem Selbstmordversuch 1826. Ohne große Überraschung lässt sich dann feststellen, dass die Jahre unmittelbar nach 1815 in Beethovens reifer Schaffenszeit künstlerisch am wenigsten ertragreich waren. Erst 1818/19 begann seine schöpferische Auferstehung in vollem Umfang, mit der Komposition der riesigen Hammerklavier-Sonate op. 106 (einer Symphonie für Klavier solo, nur nicht dem Namen nach). 1819 nahm Beethoven dann die Arbeit auf an einem bedeutenden neuen Auftrag: einer Messe zur Ernennung seines früheren Schülers und treuen Mäzens Erzherzog Rudolph zum Erzbischof von Olmütz (heute Olomouc in Tschechien) am 9. März 1820. Dass die Beziehung zu Rudolph für Beethoven von großer Bedeutung war, geht aus der Widmung der Klaviersonate Les Adieux op. 81a an den Erzherzog hervor, deren drei Sätze auf bewegende Weise die emotionale Abfolge „Lebwohl“, „Abwesenheit“, „Wiedersehen“ schildern—Rudolph hatte 1809 während der französischen Besatzung aus Wien fliehen müssen. Daher war der Auftrag zur Komposition der Missa solemnis ebenso eine aktuelle Erinnerung an ihre dauerhafte Freundschaft wie ein Ansporn, das Vertrauen zu rechtfertigen, das Rudolph in den Komponisten setzte. Als jedoch der Tag von Rudolphs Bischofsweihe kam, war Beethoven erst beim Credo der Messe angelangt. Er brauchte bis zum Mai 1822, um die gesamte Partitur zu vollenden, und auch dann folgten noch einige Überarbeitungen. Erst am 19. März 1823 konnte Beethoven Rudolph eine Reinschrift überreichen. Für einen Künstler, der begonnen hatte, sich mit östlichem religiösen Gedankengut auseinanderzusetzen, vor allem der hinduistischen Bhagavad-Gita, und schrieb, „Sokrates und Jesus sind meine Vorbilder“, mussten Sailers Schriften das sprichwörtliche Geschenk des Himmels sein. Ein Beweis für die Betonung der „innersten Empfindung“ im Sinne Sailer findet sich in Beethovens geringfügigen, doch entscheidenden Änderungen des Messetextes: die sehr persönlichen „O“s und „Ah“s als Ergänzung zu dem Wort „miserere“ („erbarme dich“) im Gloria, das Wort „credo“ („ich glaube“), das im Credo refrainartig wiederkehrt, und die häufige Betonung durch Wiederholung des Wortes „et“ („und“) ebenfalls im Credo, als wolle Beethoven unbedingt zum Ausdruck bringen, dass die Bedeutung des Glaubensbekenntnisses als Ganzes, als dramatische narrative Abfolge bedeutender sei als jeder einzelne Teil. Das macht das eruptive Allegro vivace, mit dem das Gloria beginnt, um so fesselnder. Der Chor wird von einer brillanten Orchesterwoge mitgerissen—wir fühlen uns der Opernbühne sicher näher als der Kathedrale. Die Phrase „Gratias agimus“ („Wir danken dir“) bringt eine Verlangsamung des Tempos und einen Wechsel zur Tonart B-Dur, die im Verlauf der gesamten Messe eine gewichtige Alternative zur Grundtonart D-Dur bleiben wird. Das Herzstück des Gloria ist das viel langsamere „Qui tollis peccata mundi“ („der du die Sünden der Welt trägst“). Das persönliche Element, das in dem einleitenden Kyrie im Hintergrund gehalten worden war, tritt jetzt mit den Sopranstimmen des Chors hervor, die auf dem Höhepunkt des Satzes bei den Worten „qui sedes ad dexteram patris“ („der du zur Rechten des Vaters sitzt“) zu strapaziösen hohen B gedrängt werden. Beethovens Verehrung für Händel—und besonders die „Amen“-Fuge, die den Messiah beschließt—ist in der mächtigen 4/4-Fuge bei der Textstelle „In gloria Dei patris“ („zur Ehre Gottes des Vaters“) zu spüren. Diese scheint sich, wie bei Händel, zu einem kräftigen „Amen“-Schluss aufzubauen; im letzten Augenblick jedoch reißt uns Beethoven den Boden unter den Füßen weg und schleudert uns mit der Wiederkehr der Anfangsworte des Gloria zurück zu dem aufwogenden 3/4-Takt des Eingangs. Das abschließende „Gloria“ ruft der Chor ohne den emphatischen Schlussakkord des Orchesters, als recke er sich über die im Kyrie so schön dargebotene rituelle Formalität hinaus. B-Dur, die „alternative“ Tonart im Gloria, wird die Grundtonart für das Credo. Die aufwärts hüpfende Anfangsfigur erinnert an das federnde Motiv, das die Hammerklavier-Sonate (ebenfalls in B-Dur) in Gang setzt. Die Ähnlichkeit mag absichtlich gewesen sein. Die Hammerklavier-Sonate war ebenfalls Erzherzog Rudolph gewidmet, und in einer frühen Skizze hatte Beethoven ihrem herrlichen Anfangsmotiv die Worte „Vivat Rudolphus!“ („Lang lebe Rudolph!“) unterlegt. Bei der Textstelle „Et incarnatus“ („Und er ist Fleisch geworden“) beginnt eine der anschaulichsten Passagen der Messe. Während Chor und Orchester diese Worte in dem damals archaischen dorischen Modus intonieren (eine d-Moll-Skala, aber mit einer erhöhten Sexte und einer erniedrigten Septime), scheint die Soloflöte hoch oben weiterzufliegen, ohne an das Hauptthema gebunden zu sein, auf bezaubernde Weise schildernd, wie der Heilige Geist, einer Taube gleich, während der Empfängnis über der Jungfrau Maria schwebt. Beethoven verweilt liebevoll bei diesem Bild, türmt dann bei den Worten „cuius regni non erit finis“ („seiner Herrschaft wird kein Ende sein“) einen ekstatischen Höhepunkt auf, um durch die nächsten dogmatischen Kernsätze zu eilen, die er mit Wiederholungen der Worte „Credo, credo“ vorantreibt. Wie der Musikwissenschaftler Joseph Kerman meint, scheint „reiner, fester Glaube“ mehr zu wiegen als der „Glaube an irgendeinen bestimmten Lehrsatz“. Doch dann werden die letzten Worte des Credo, „Et vitam venturi saeculi, Amen“ („Und das Leben in der kommenden Welt, Amen“), zu einer riesigen Fuge ausgestaltet—eben die Fuge, deren Komposition (laut Anton Schindler) Beethoven solche Qualen bereitet hatte. So rührig sich der Kontrapunkt über weite Teile gebärdet, der Schluss ist überraschend ruhig—Skalen der Holzbläser und Streicher verlieren sich wie Weihrauchwolken in der Höhe. Beethoven verschmilzt den Sanctus-und Benedictus-Teil der Messe zu einem einzigen fortlaufenden Satz. Das Sanctus, mit seiner kurzen, „mit Andacht“ vorzutragenden Einleitung, ist ungewöhnlich knapp und vorwiegend gedämpft. Bei den Worten „Pleni sunt caeli et terra gloria tua“ („Erfüllt sind Himmel und Erde von deiner Herrlichkeit“) brechen Chor und Orchester in einen fröhlichen, tänzerischen Kontrapunkt in Bach-Manier aus. Bei größeren Messfeiern zu Beethovens Zeit wurde es gewöhnlich mit einer ruhigen improvisierten Orgeleinleitung dem Benedictus—der Zeitpunkt, wenn Brot und Wein gesegnet werden—vorangestellt. Beethoven liefert, wie es sich gehört, ein verhaltenes orgelähnliches Präludium, das üppig mit tiefen Holzbläsern und Streichern besetzt ist und vom Orgelpedal gestützt wird. Seine vollen, tiefen Klänge bieten einen vorzüglichen Kontrast zu dem Klang der hohen Solovioline und Flöte—ein plötzlicher Lichtstrahl, der den Abstieg des Göttlichen schildert. Der heitere, tänzerische Charakter des sich anschließenden Andante molto cantabile, die Solovioline, die sich hoch über den Stimmen wölbt und wie ein Vogel trillert, war für manche puristische Ohren eine Beleidigung. Für andere ist es schlicht nur das Herrlichste der gesamten Partitur—ein wunderbar reiner Ausdruck der „Seligkeit“. Im abschließenden Agnus Dei wird die Spannung zwischen liturgischem und weltlichem, opernhaftem Ausdruck deutlich. Das düstere, eindringliche Anfangsgebet um Gnade, das der Bass-Solist anstimmt, steht in h-Moll, der Tonart, die Beethoven als „schwarz“ bezeichnete. Tempo und Stimmung werden heftiger und hoffnungsvoll bei den Worten „Dona nobis pacem“ („Gib uns Frieden“). Doch bald geschieht etwas Ungewöhnliches: Bedrohliche kriegerische Fanfaren sind zu hören, zunächst in der Ferne, aber immer drängender werdend, in der „alternativen“ Tonart B-Dur. Die Gebete der Solisten um Frieden (mit der Vortragsbezeichnung ängstlich) nehmen eine fast verzweifelte Dringlichkeit an, die nur noch heftiger wird, wenn dieser martialische Ansturm auf dem Höhepunkt des Satzes wiederkehrt. Erinnerte sich Beethoven an die Bombardierung Wiens im Jahre 1809? Glaube und Zweifel, die nebeneinander bestehen, ohne einander auszuschließen—wenn es das ist, was in dem „nicht ganz aufgelösten“ Schluss von Beethovens Missa solemnis zum Ausdruck kommt, so macht es dieses sehr persönliche Credo nur noch beweiskräftiger und dauerhaft faszinierend. Domine, Fili unigenite, Jesu Christe. we adore Thee, we glorify Thee. We give Thee thanks for Thy great glory. wir beten dich an, wir rühmen dich. Wir danken dir, denn groß ist deine Herrlichkeit. Herr, eingeborener Sohn, Jesus Christus. Jesus Christus, mit dem Heiligen Geist. Zur Ehre Gottes des Vaters. He sitteth at the right hand of the Father. Who proceedeth from the Father and the Son. for the remission of sins. né du Père avant tous les siècles. pour le pardon des péchés. aus dem Vater geboren vor aller Zeit. ist er vom Himmel gekommen. hat gelitten und ist begraben worden. der gesprochen hat durch die Propheten. Benedictus qui venit in nomine Domini! Holy is the Lord God of hosts. Saint le Seigneur, Dieu de l’univers. Heilig Herr, Gott der Heerscharen. 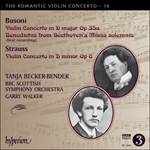 The fact is that Busoni is known as much for his transcriptions and arrangements as for his original music. Perhaps it was his desire to inhabit the works of his predecessors that led him to make his own versions of their creations. 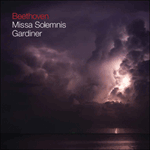 The transcription of the Benedictus from Beethoven’s Missa solemnis is interesting in that it brings the solo violin to the fore, with instrumental obbligati representing the vocal contributions. Breitkopf und Härtel published it in 1916. Il est vrai que Busoni est connu autant pour ses transcriptions et ses arrangements que pour sa musique originale. Son désir d’habiter les œuvres de ses prédécesseurs fut peut-être ce qui l’incita à en livrer ses propres versions. Sa transcription du Benedictus de la Missa solemnis beethovénienne vaut par sa mise en avant du violon solo, des obbligati instrumentaux symbolisant les contributions vocales. Breitkopf und Härtel la publia en 1916. Busoni ist tatsächlich für seine Transkriptionen und Bearbeitungen ebenso bekannt wie für seine Originalkompositionen. Vielleicht wollte er sich die Werke seiner Vorgänger, durch die er zu seinen Versionen angeregt wurde, ganz zueigen machen. Die Transkription des Benedictus aus Beethovens Missa solemnis ist interessant, weil sie die Solovioline herausstellt und Instrumentalobligati für die Vokalpartien verwendet. Sie erschien 1916 bei Breitkopf & Härtel. die Sünde der Welt, erbarme dich unser. die Sünde der Welt, gib uns deinen Frieden.